Modern TV Stand Guide: 12 Consoles You'll Covet! Gone are the days of golden oak tv consoles and wall units that dwarf your living room. Thank goodness! In their place we're seeing sleeker modern tv stand designs that complement your home instead of overpowering it. No offense if you have an entertainment center like this and love it, but they're certainly not for everyone. If you prefer a more up-to-date TV stand that is updated and functional, then we're sure you'll love one of our Top 12 TV consoles for 2019! I bet you're wondering what exactly we look for when selecting our "best of the best." If not, we're going to tell you anyway (so click here and you can skip on down to the selections). Maybe it sounds shallow, but the most important thing to consider when selecting a TV stand is how it looks. Crazy fact: The average American spends more than 7 hours (per day) watching television. Even if you spend just 25% versus the average person, that's still more than a dozen hours per week in front of the tube. And whenever you sit down to watch television - be it news, Netflix or the latest action flick (or rom-com in my case) - there's your TV stand! I know, I know; you're watching the television not the stand. But it's in your periphery. And, chances are, it's one of the focal points in your living room! So, since you don't have tunnel vision (I hope), your TV stand is in view as well, its appearance can make a huge difference in the overall aesthetic of your living room. All this to say, shouldn't you enjoy the way it looks? And for that reason, we picked TV stands of all different styles and finishes. Whether you want a mod white TV stand or a floating design, we're here to ensure you find one you love that fits your space to a tee. We chose to only include TV stands that are manufactured at the highest standards because we know that this is an investment you'll want to last for a long time. Each of the vendors that we selected from is known for quality furniture and excellent craftsmanship. By being choosy you can rest assured that after your extensive research, i.e., reading this awesome blog post, that your efforts will not be for naught. No matter which of the 12 options you choose, you can be certain that it will stand (pun intended) the test of time. Like you, one of the deciding factors of whether or not to buy something is price. Because of that we've made sure to include a wide range of options. In an ideal world you'd of course be able to buy anything at anytime, but since that's not really the case for most of us, we've made sure that you'll find something to fit any price range. 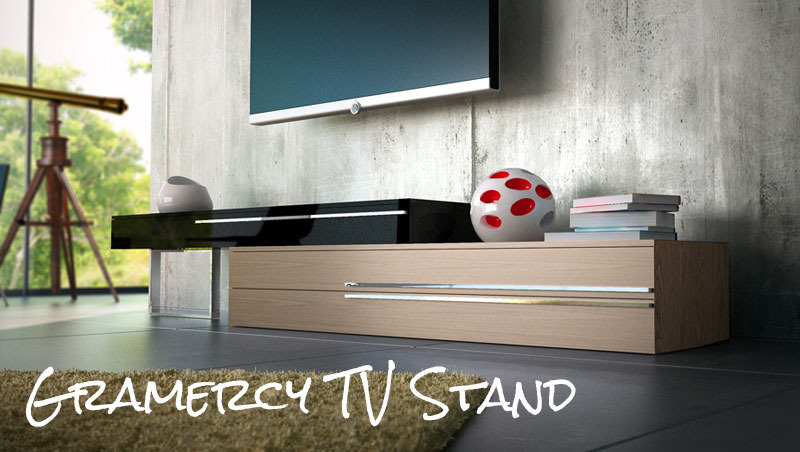 We'll begin with one of our best sellers, the sleek and modern Gramercy TV Stand. Gramercy is the epitome of a modern entertainment center. By combining wood veneer and lacquer along with stainless steel legs and trim, the Gramercy makes a bold statement. A stacked cabinet design offers ample storage space to go along with its minimalist aesthetic and comes in two color combinations so you can select the one that fits your space. Click here for EXCLUSIVE SAVINGS on the Gramercy! This one's definitely interesting to look at and although it's not my style per se, I like it. I like its clean and straightforward appearance and the combination of lacquer and wood veneer makes it unique. Styled with a few books and maybe a small plant to soften the look a bit, the Gramercy could work for me. I really like Gramercy's versatility! I agree on the accents to soften it. But I also love that it can span a looong wall. Gramercy is the perfect blend: a long TV stand that's adjustable. For me, that means it will work with any size TV and any mid to large modern living room. If you're looking for a more organic approach to design and materials, then the Kulu TV Console might be the perfect fit. We love that it is made of sustainably sourced seared French Oak and accented by gilded, sculpted and recycled cast iron legs and trim. Who doesn't love that? 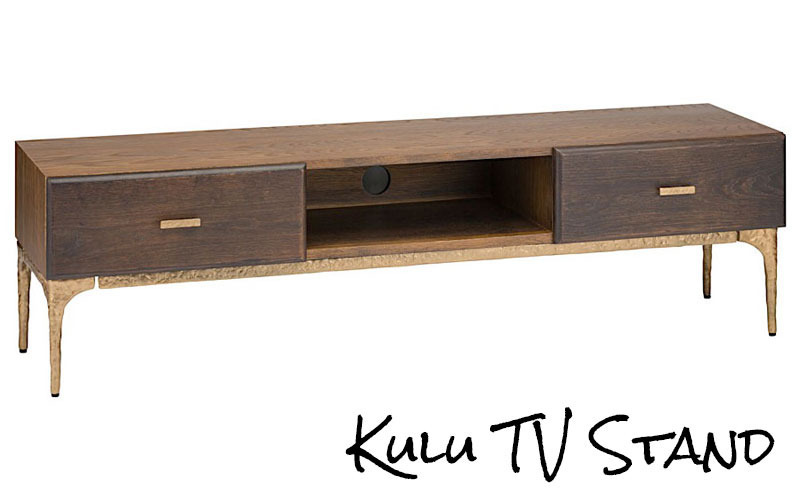 Click here for EXCLUSIVE SAVINGS on the Kulu TV Stand! I really love the gilded accents on the Kulu and that they're actually recycled cast iron, plus their sculpted nature is so interesting to me. The overall warmth that the Kulu evokes is what I like the most and the sustainably sourced materials are something that would definitely put this one towards the top of my list. From the outside, our Christopher Media Cabinet may appear to be all business. But, take a look behind the slate tinted glass doors and you'll find a surprise interior color of nile blue within the asphalt cabinet and steeple gray complementing the white cabinet. Behind those same remote control-friendly doors, you'll find something else, ample shelf storage and even a couple of drawers, too. 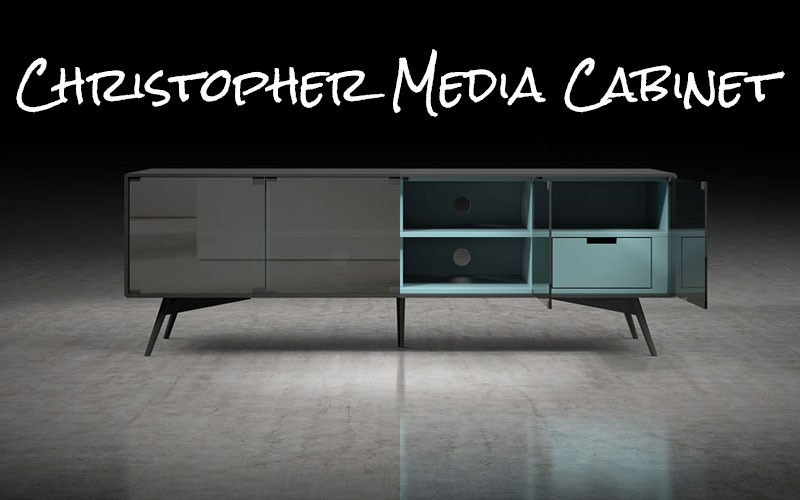 Click here for EXCLUSIVE SAVINGS on the Christopher Media Cabinet! The blue interior of the asphalt version of the Christoper is amazing! I really appreciate attention to details like this and would probably never want to shut the doors, which could be a problem with kids and pets. Really, the only problem that I could see with this cabinet is the glass doors and my loathing of fingerprints, which are inevitable with children. I'm the same - I LOVE the color combinations. In fact, I know Christopher is specifically designed to be a TV cabinet with doors, but I think I would lose them! The white design is super clean. Both the lines and utility of Christopher make it a really great console. Practical and practically perfect, our Rowan Media Center is made of eco-friendly solid Moso bamboo. The slatted design of the Rowan allows the infrared light from your remote controls to reach your devices and provides proper ventilation of your electronics, not to mention it makes for an eye-catching design. 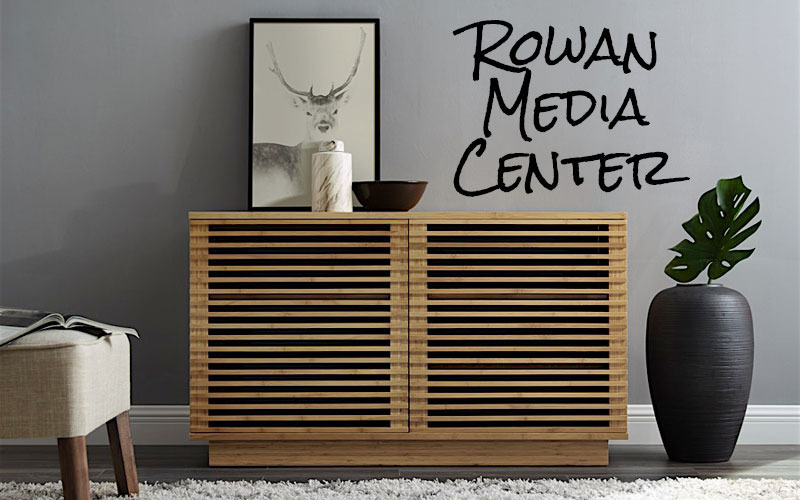 Click here for EXCLUSIVE SAVINGS on the Rowan Media Center! The charm of the Rowan is that it doesn't really look like a media center. Simply put, it's an attractive piece of furniture that is also incredibly functional. I appreciate that it is made from bamboo, making it a "green" choice and the fact that it comes in multiple sizes/colors is a plus too. Definitely like the green aspect of all our bamboo furniture, the Rowan included! I also love the slatted look and functionality. It's taller than most of our TV stands, which makes it perfect if you're on the hunt for a bedroom TV stand. Two sliding doors and a chic Mid-century silhouette give our Haru Media Cabinet a little something special. This solid wood piece is available in three different finishes, natural oak, black oak and walnut, so you're sure to find one that you dig. Angled legs and contrasting details on the legs and doors add to the Haru's overall appeal and style quotient. Need a black TV stand? Haru in the Black Oak gives you everything you could want! 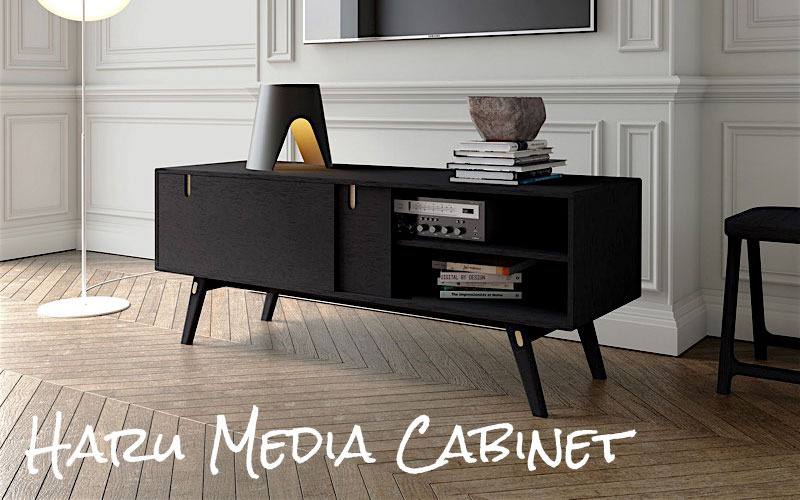 Click here for EXCLUSIVE SAVINGS on the Haru Media Cabinet! The straightforward style and choice of 3 different finishes makes me appreciate all that the Haru has to offer. Its no-fuss design is refreshing and its simplicity is what makes it stand out, in my opinion. For me, this is a case in which less is more. Haru is super simple. Cabinet, shelves, two sliding doors... that's it. The simplicity makes it really versatile. You'll have plenty of room for components and the like. The only thing it's missing is a drawer (if you haven't broken up with your remote collection). Haru's Mid-Century accents move it up my list, for sure. You'll be floating on air, much like our (wall-mounted) floating TV stand: Drift. This industrial-inspired solid French Oak cabinet is finished in a smoked or black stain and is topped with a blackened steel plate for added durability and style. A single fold down door allows access to your media components and is accented by a silver (black oak) or brass (smoked oak) door pull. 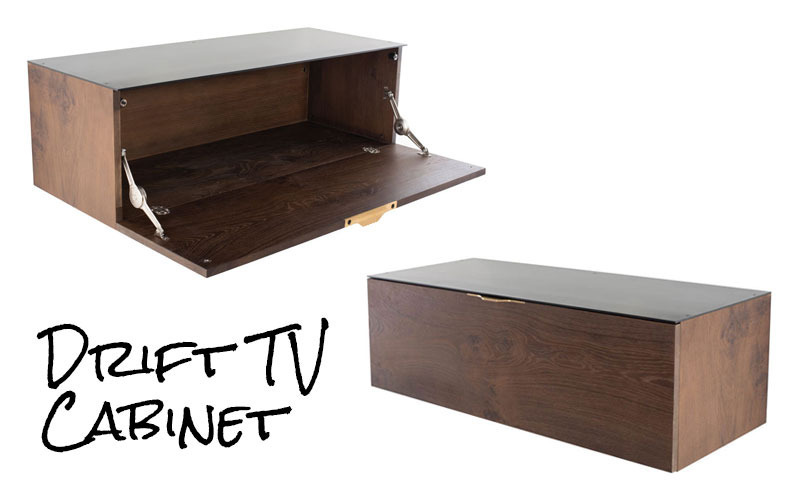 Click here for EXCLUSIVE SAVINGS on the Drift TV Cabinet! The practical part of me really likes the drift because you don't have to figure out how to clean beneath it. Plus, it is wall-mounted much like many flat screen televisions, so it kind of makes sense. The industrial look isn't exactly what I would normally be drawn to, but I think it could be perfect in the right setting. I find people either love or hate the Drift. It's an incredibly simple floating TV stand, but the craftsmanship is high-end and it makes for a upscale clean living room. I really like the steel plate on top - you'll never have to worry about scratching it. Drift's only downside is its size. At about 39-inches wide, I don't think I would put it underneath a big television. A rounded case wrapped in rich walnut veneer and polished steel legs give our Murrah TV stand its characteristic appearance. With a blend of retro and new-age design, Murrah is the best of both worlds: a low profile TV console that has ample open and closed storage for all of your components and more. Choose from full walnut veneer or white lacquer and walnut veneer options. 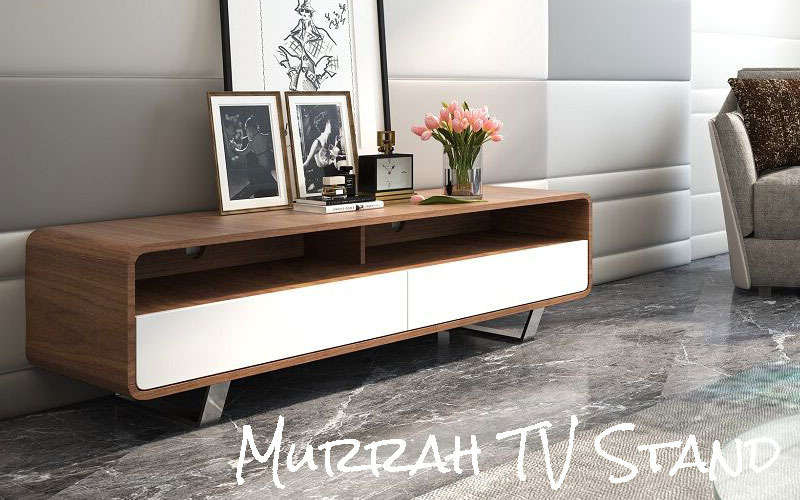 Click here for EXCLUSIVE SAVINGS on the Murrah TV Stand! With loads of styles to choose from, I'm surprised how much I like the Murrah because its definitely more modern than I typically prefer. But, there's something about the rounded shape and open shelving that I really enjoy. To me it has a Jetson's vibe going on and I'm alright with that! I think Murrah might be one of my favorites too. I like almost everything about it: the rounded shape, the walnut wood veneer, the angled steel legs, the open shelving. I'm not a huge fan of drawers (they all seem to turn to "junk drawers"), but Murrah seems like a great set up. If you were to look at a vintage Better Homes and Gardens magazine, you might see something almost identical to our Franklin Mid Century TV Stand. With classic good looks that consist of wood veneer, tapered legs, hardwood edging and softly curved pulls, Franklin might just distract from the television you place atop it. We love a good throwback and think you will, too! 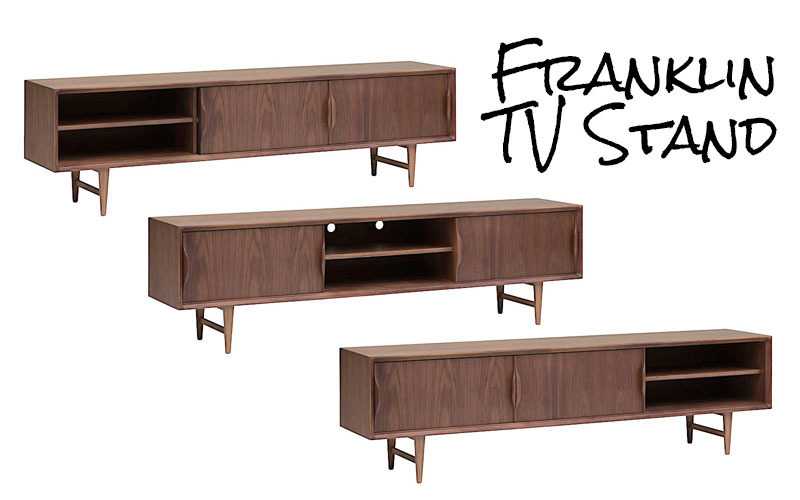 Click here for EXCLUSIVE SAVINGS on the Franklin TV Stand! I think the Franklin is pretty perfect. I love the attention to detail and the classic design that will never go out of fashion. For me, if you're going to invest in a piece of furniture, its style should be enduring and I think that this TV stand is just that. Not too trendy, but just right. We're in agreement here! Franklin is pretty perfect. Mid-century styling. Warm walnut veneer with hardwood accents. Open shelving combined with sliding doors. If I have to pick just one, it's Franklin. Our Eldridge Media Cabinet is the quintessential piece for someone that prefers a clean and contemporary look. With the option of walnut, wenge (espresso) or sleek white lacquer finishes, you can customize the Eldridge to meet your needs. As one of our more compact cabinets, the Eldridge will still give you loads of drawer and shelf space for your components and DVD library, so all you have to do is choose your favorite finish and we'll do the rest. 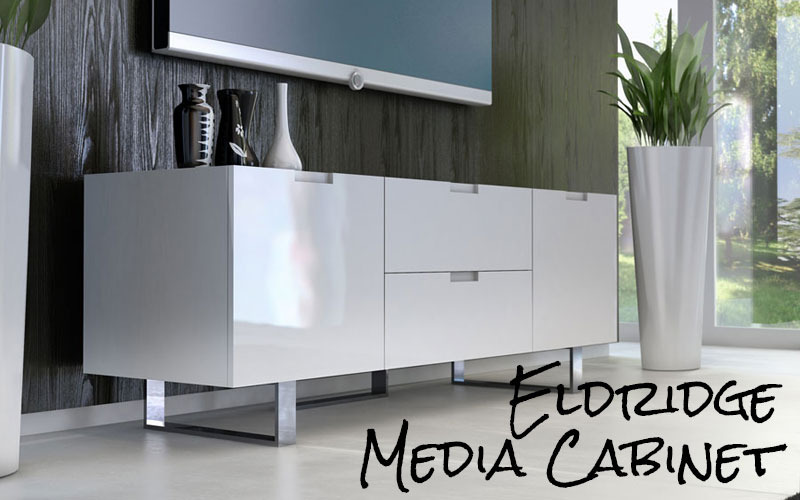 Click here for EXCLUSIVE SAVINGS on the Eldridge Media Cabinet! A media cabinet that will cover all the bases and look great can be hard to find, but I think the Eldridge fits the bill. I really like that it comes in several colors, but most of all, white. There's just something about the white that really stands out to me and I think it would look amazing in a modern living room. Eldridge has been sort of the staple TV stand in our line for a long time. The design is clean and modern. It's got the right blend of functionality and storage. The recessed pulls are cool, not flashy. I get why Eldridge has been a best-seller. Drawers and doors galore, eco-friendly solid Moso bamboo and style to boot, our Currant TV Stand is definitely a keeper. Quality craftsmanship, rounded edges, and a choice between caramelized or black walnut stain are just a few of the fabulous features you'll find in this "green" TV stand. Click here for EXCLUSIVE SAVINGS on the Currant TV Stand! The Currant is another TV stand that I feel good about because of its eco-friendly bamboo construction. This one has a more traditional look to it than the Rowan, so it might be good for someone looking for that. The grooved pulls at the bottom and top of each of the doors and drawers and rounded edges are subtle, but I like that about it. Currant follows the Rowan in a lot of ways, including all of the benefits of bamboo furniture. Personally, I think I like the design of the Rowan, but Currant definitely has more functionality and versatility in terms of storage. It's also tall, like Rowan, which I think goes better in more transitional and mixed decors. Who doesn't love a pop of color? The Maarten TV Stand provides just that with its enclosed sets of drawers in cream and mint green that can also be concealed by its sliding doors. With its tapered legs and and low-slung profile, Maarten evokes a nostalgic feel and is perfect for Mid-century modern fans and minimalists alike. 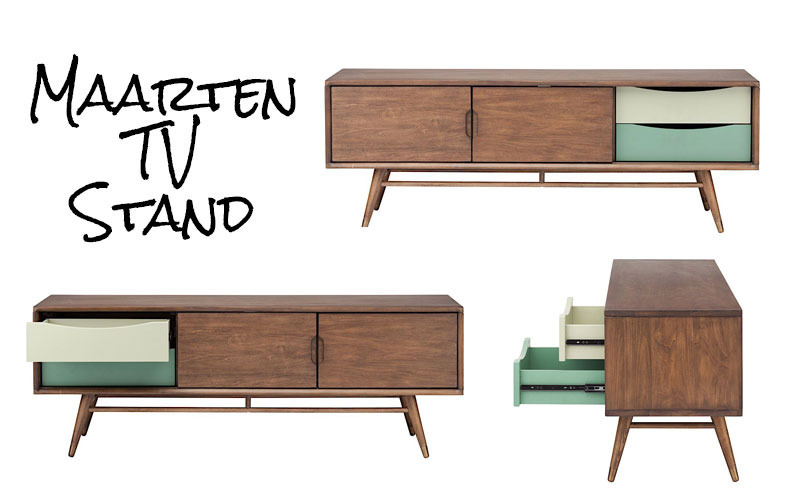 Click here for EXCLUSIVE SAVINGS on the Maarten TV Stand! Looking at the Maarten, the first thing that I notice is those colored drawers. This detail is what I love most about it and personally, I would want the colors shown at all times. But, the great thing about the Maarten is that if it isn't your thing, they can easily be concealed by the sliding doors. Maarten is right up there with Franklin. 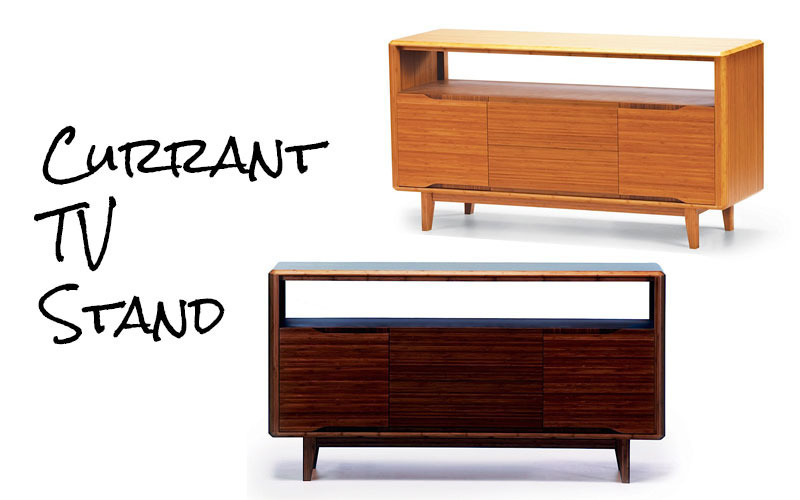 If I was looking for a TV console with drawers, I think Maarten would be my favorite. The trestle base and colors really give it the Mid-century vibe. If Franklin is my #1, Maarten would have to be #1A. We dig everything about our Baxter Media Cabinet, from its warm walnut and gray oak veneer to its sophisticated matte gray lacquer. Add to that the slim powder coated legs and the variety of storage spaces and we can't find a single thing we don't love. Baxter's cubist-inspired design will be perfect for a modern penthouse, industrial loft... or anywhere else for that matter. 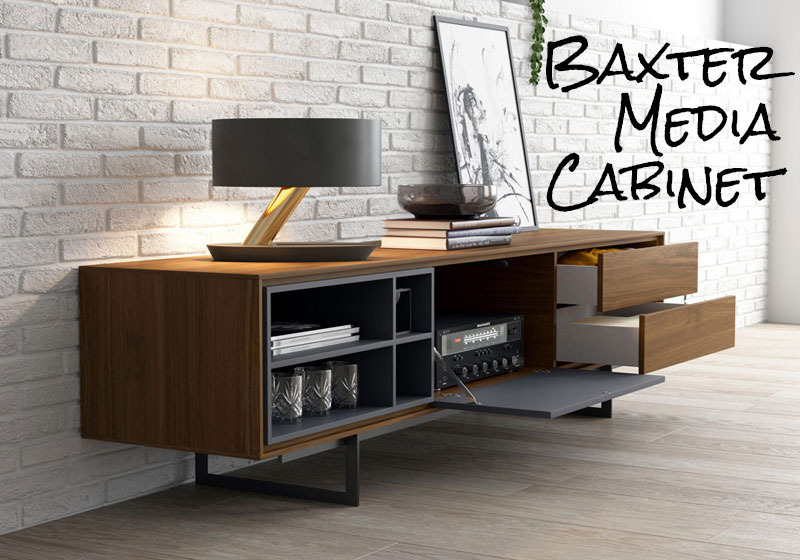 Click here for EXCLUSIVE SAVINGS on the Baxter Media Cabinet! The Baxter certainly has a great look and the details, like the matte finish and the slim legs give it an appearance that is current and cool. The storage versatility is also a fun element that it has to offer and I think it could be a stand-out piece depending on how you choose to style it. To me, Baxter sort of embodies modern design right now. The contrasting materials and finishes, the low-profile shape, the slim steel legs - all of it really makes Baxter the mod tv stand of choice for 2019. As you can see, we have lots of favorites, which made it difficult to narrow our list down to just 12. So, if you didn't come across one that speaks to you, then be sure to check out our Modern TV Stands where you'll find many more to choose from. And if you'd like our opinion on one or a few, don't hesitate to ask! Post written by Meagan Sykes with contributions from Kevin Sykes. 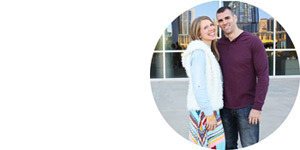 Meagan is the Creative Director, and Kevin is a Co-Owner and Co-Founder of Modern Digs. Meagan and Kevin live in Austin, TX and love all things mid-Century modern.